Did you know that numbers are also made up of letters? So confusing! 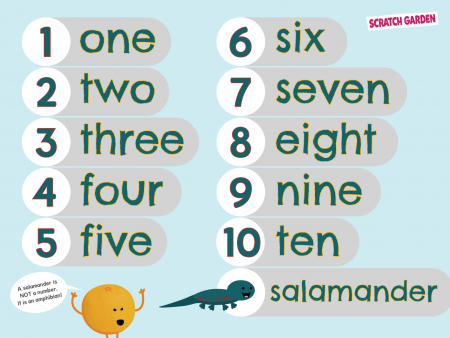 Learn how to spell the numbers with a friendly song and not-so-friendly characters. Note: A salamander – while helpful – is not necessary in order to practice spelling. How do you spell 1? How do you spell 2? How do you spell 3? How do you spell 4? How do you spell 5? How do you spell 6? How do you spell 7? How do you spell 8? How do you spell 9? How do you spell 10?